Happy 29th Birthday El Nino! LOL! I thought that was pretty funny. But it’s true – Sergio seems to have been in his 20’s forever! Soon, however, that will all be over – today El Nino turns 29. 29 – the scary age for most women who can’t stand the thought of stepping from youth into middle age. Most men I know didn’t really care that much about hitting the big 30, but most women I know, dreaded it. “Growing up” has been tough for the fiesty Spaniard. His volatile nature and zest for life have resulted in behaviors and comments that many found “inappropriate” for a professional golfer. Certainly spitting in the cup, shoe throwing and divot smashing are not antics you’d see from the likes of Tiger Woods. But then again, Tiger was “trained” not to do those things, not to say the wrong things in front of the camera, not to whine. 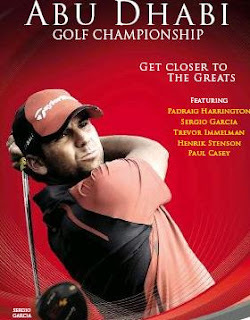 Sergio wasn’t “trained” by the great Earl Woods or disciplined by Tida, who carried the big stick in the Woods family. No…Sergio had to learn maturity the hard way – by making mistakes, lots of mistakes (hey…just like rest of us). Tiger doesn’t seem to make mistakes, not on the golf course and definitely not in front of the media. Whereas many have said that Tiger isn’t quite human – Sergio is as human as they get. Who knows why he’s taking a bit longer to mature. Maybe he’s a late bloomer. Maybe his parents were too easy on him. Maybe they were so amazed by his talent, they just spoiled him rotten. I sure see a lot of that with some junior golfers I know. I wish I could smack their parents when I see how they let their kids “rule”. I’m not trying to make excuses for Sergio, but I do think his whining and tantrums have been blown out of proportion by media looking for something – anything – that could add a bit of drama to a sport that has so little. In any other sport, Sergio would be considered tame. Anyway…next week Sergio enters his first 2009 event in Abu Dhabi and I hope he wins. I hope it gives himself that extra bit of confidence that he needs to close the deal at a major this year. Happy Birthday El Nino! Here’s to winning the Abu Dhabi Golf Championship next week and The Open at Turnberry in July. This is your year – now go out and make the most of it!